I learned to weave in the 80s. 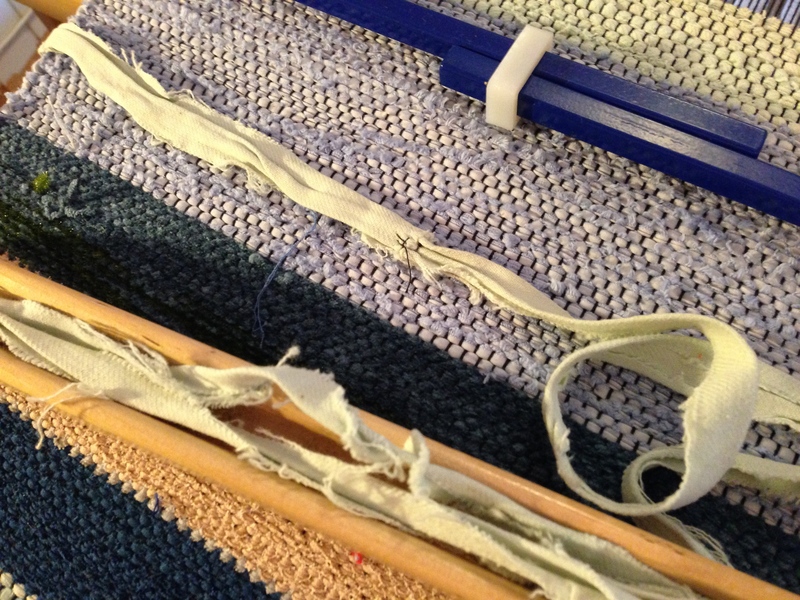 A friend and I bought a 160 cm counter march loom together, that we both used quite a lot. But life got in between, as it often does. 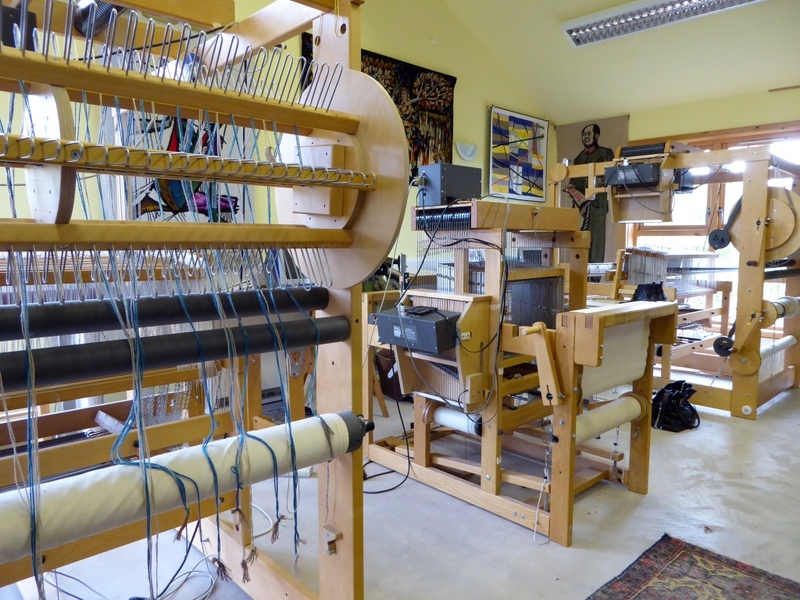 We both moved to smaller apartments, and the loom had to go on to a new owner. I was without a loom for more than two decades. 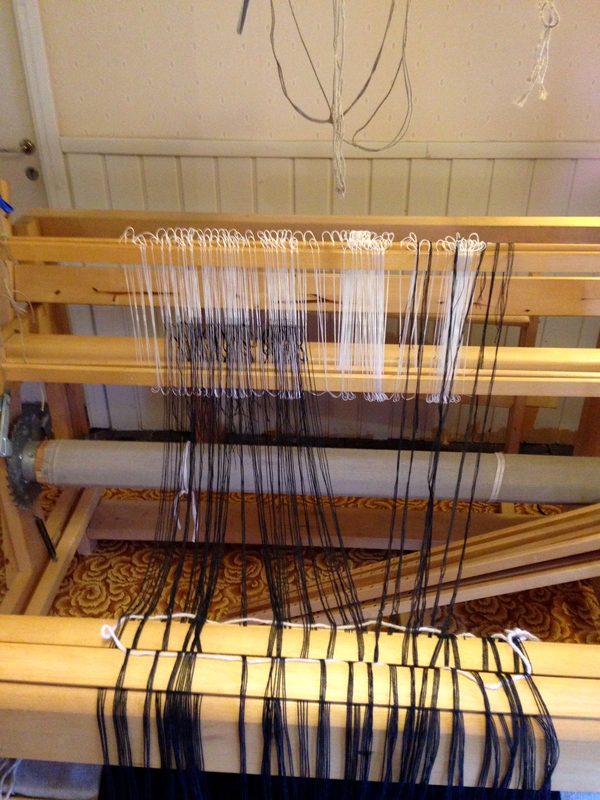 A couple of years ago I bought a smaller loom, 120 cm, also a counter march. But to my dismay I had to admit it was too big for me in my current physical condition. 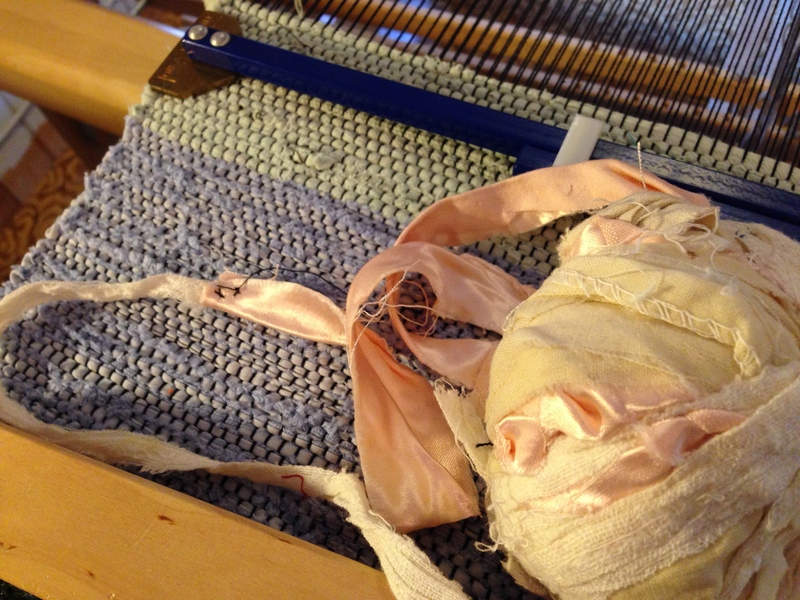 I had great difficulties crawling into it to tie the lamms and the treadles. So some weeks ago I decided it had to go. 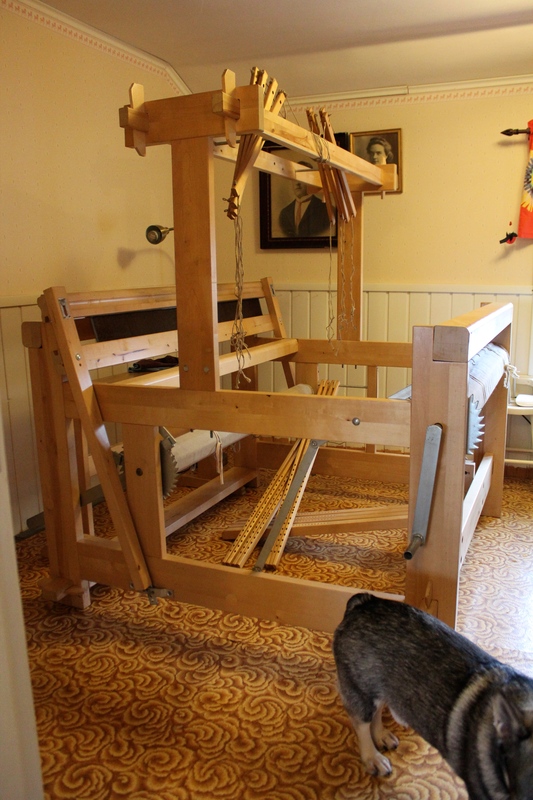 A dear friend is interested, so now the loom is in the attic waiting for her to be able to fetch it. 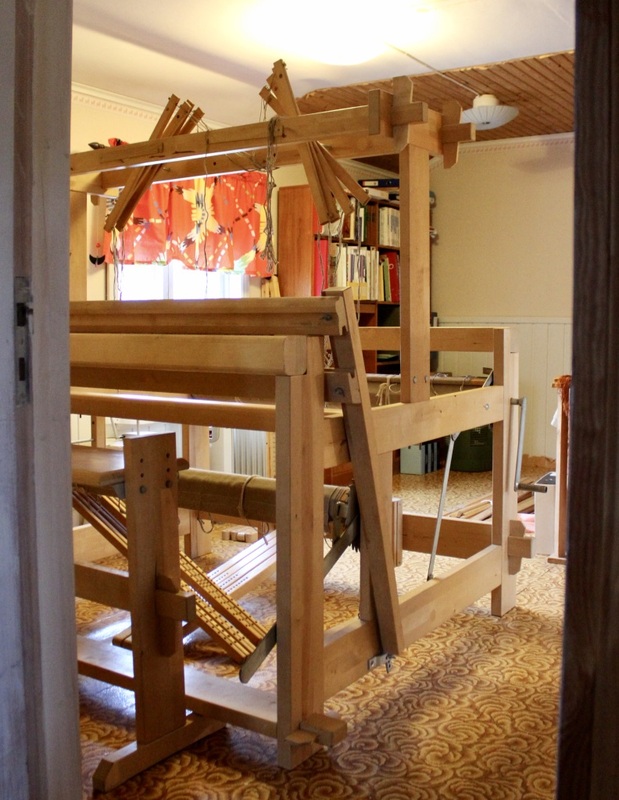 This is the 120 cm loom seen from the attic. It filled the upper landing almost completely. Instead I bought a 60 cm table loom. Hubby put it together for me, and now I’m testing it. I think I like it very much! There’s only 4 shafts, but that should be enough considering I’ll use my handspun yarns where colour and structure means more than the weaving pattern. Tabby and twill will go a long way. 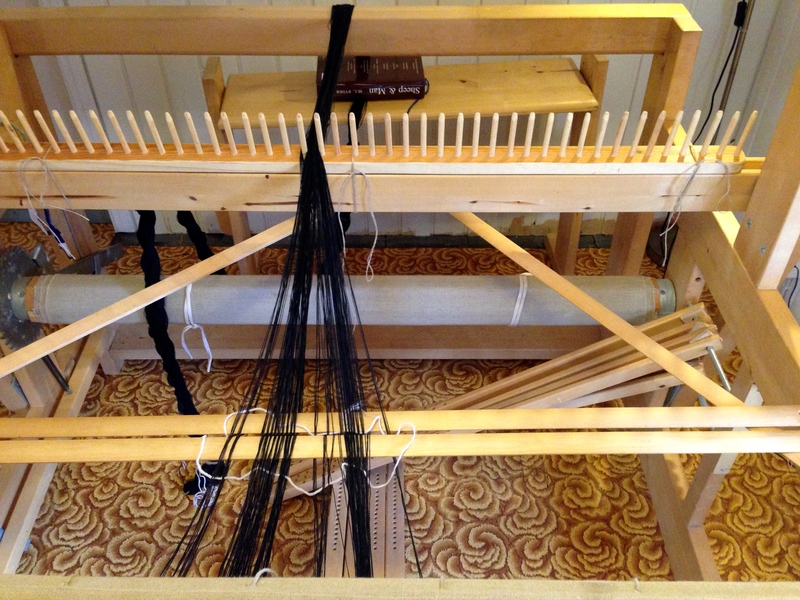 And this is my new mini-loom with weaving width 60 cm from Toika Looms. Quite a difference to what I’m used to, but not bad at all, only different. That’s twill I’m having a go at now, with sock yarns for warp and both commercial and handspun woollen yarns for weft. 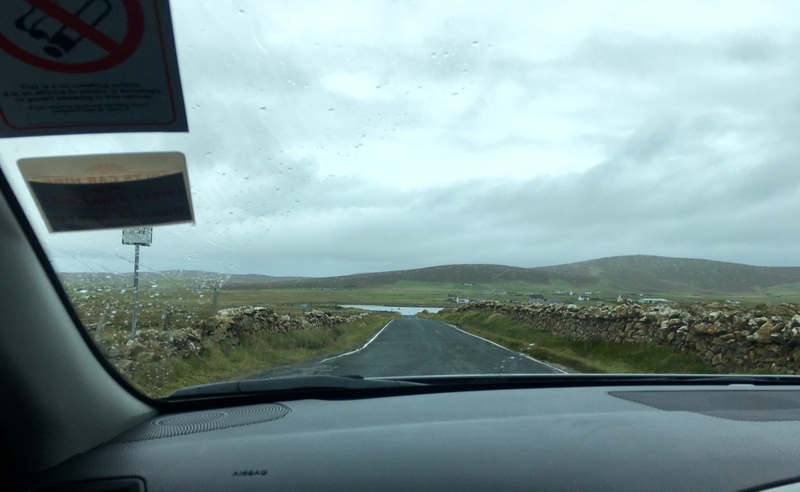 One day Kerstin and I drove to Yell and Unst. 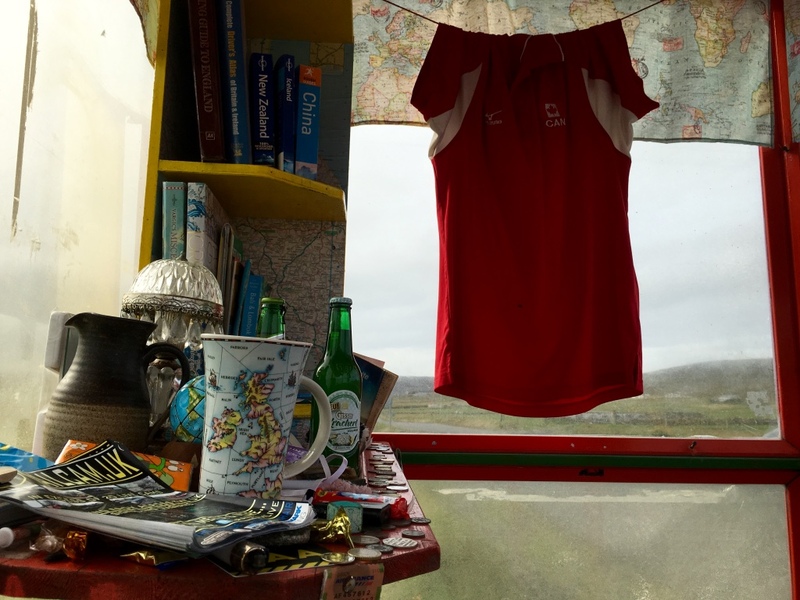 We visited Global Yell and saw the looms guided by Andy Ross. There are more looms than you can see in the photo below. Weavers may be interested in the Tours hosted by Global Yell. someone has copied some of the lace, made patterns, and sold them on Ravelry! The result is that it’s now forbidden to take photos. Things like that make me mad. Why do people act like that? And of course there was a person among the visitors this time also who took as many photos she could possibly do without her battery getting discharged… it didn’t help that she was told she wasn’t allowed to do that. Where do people like that come from? And how do their minds work? But all the same. 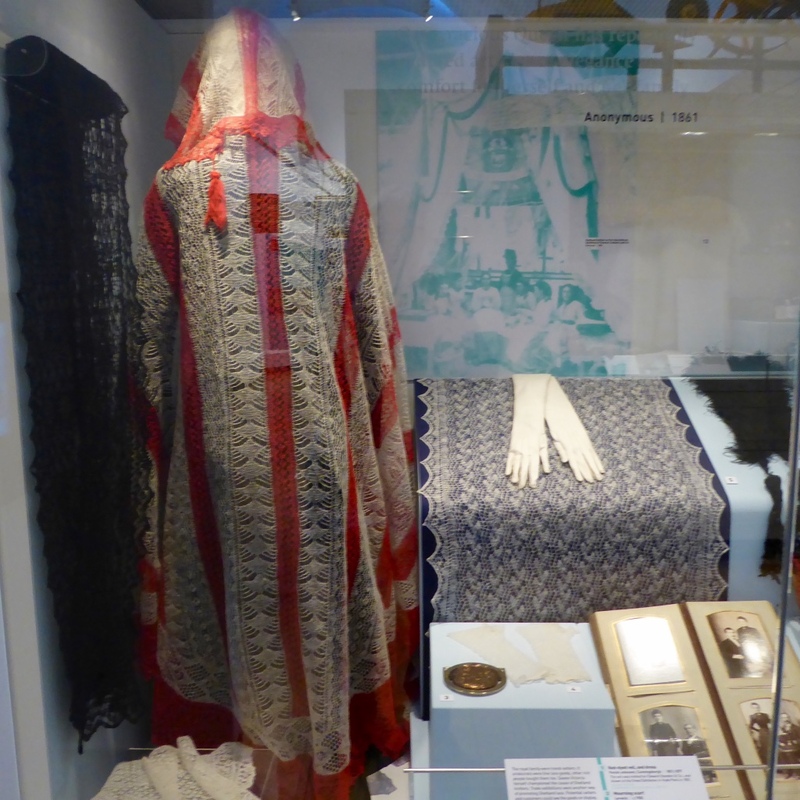 The Shetland Museum also has a lot of knitted lace, which you can see in an earlier post in my Shetland series. 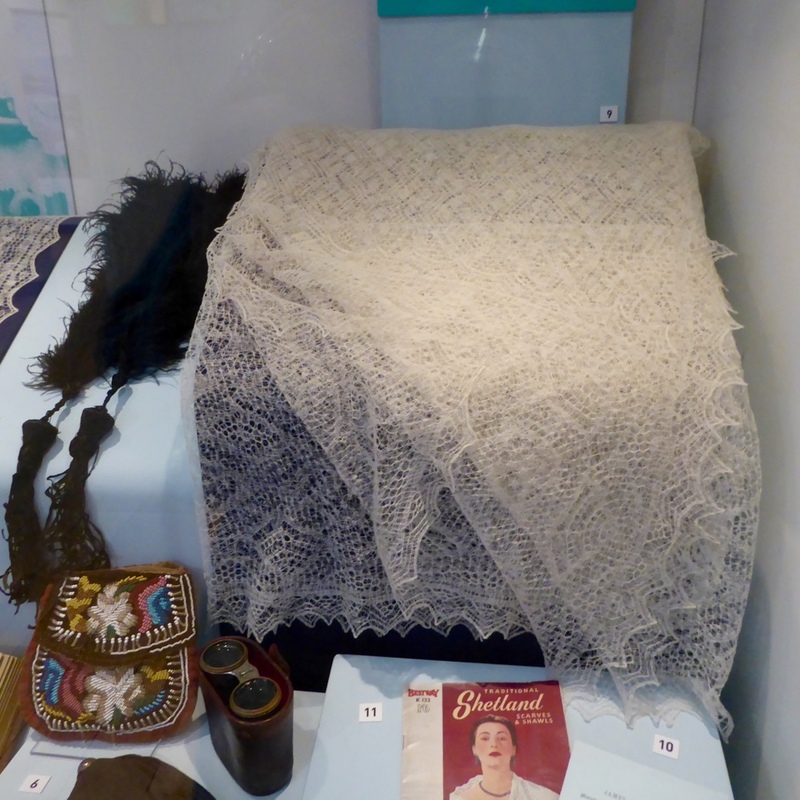 It would’ve been nice to show some of the lace in Unst Heritage Centre, as the most delicate lace was knitted in Unst. There are a few photos at the Centre’s site. Jamison & Smith has a booklet with lace history and patterns, Unst Heritage Lace. While on Unst, you must visit Foords Chocolate. You can have lunch in the cafe, and you can buy chocolate. Or have their Deluxe Chocolate Experience… at your own risk. 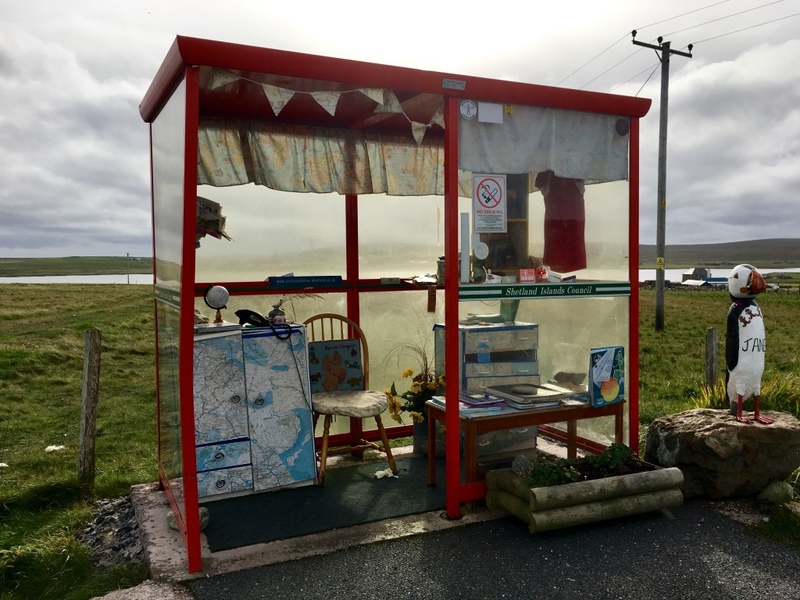 Some of you may have wondered if we missed the Bus Shelter? No we didn’t! It was a good trip, as all of Kerstin’s and my trips were during that week. Only a few drops of rain that day. 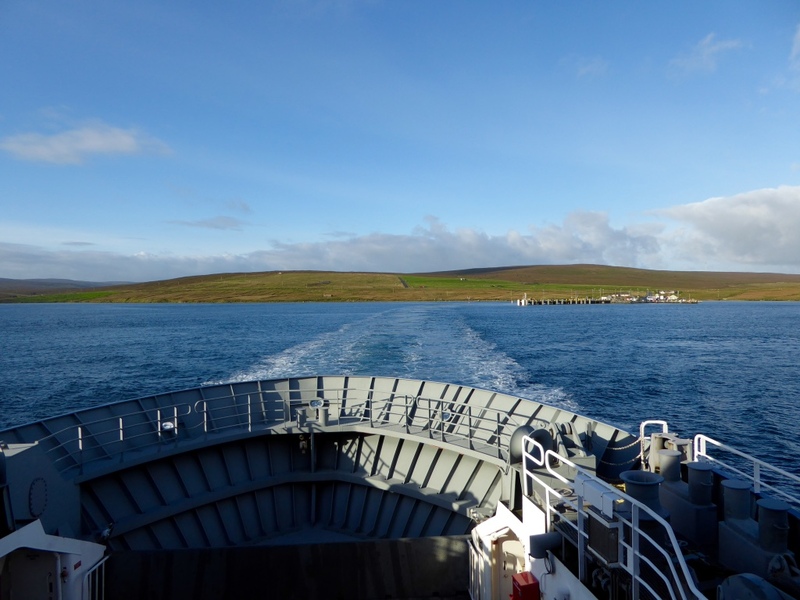 Ferries from Shetland Mainland to Yell, from Yell to Unst, and back again. I love small ferries, got used to them in my childhood in the Kvarken Archipelago. My hometown Vaasa is almost empty of people in the summer, when everyone move to their summer houses on the islands. Only the tourists wander the streets, wondering where all the natives are. 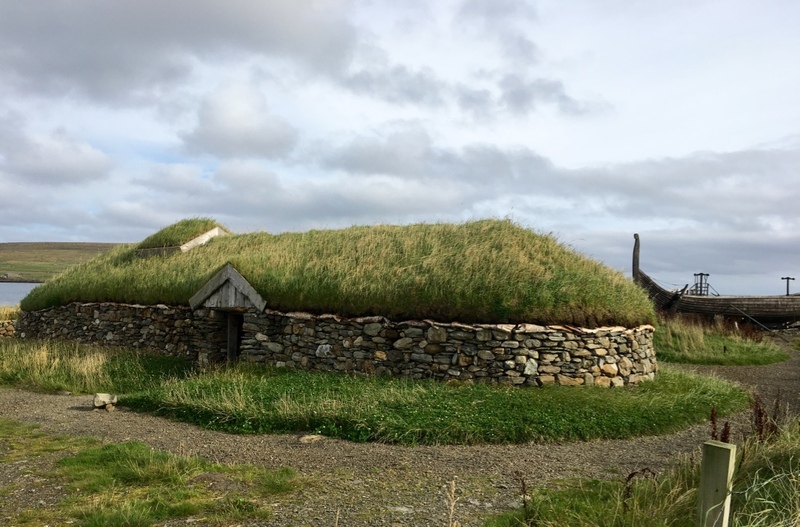 Do Shetlanders also have summer houses? 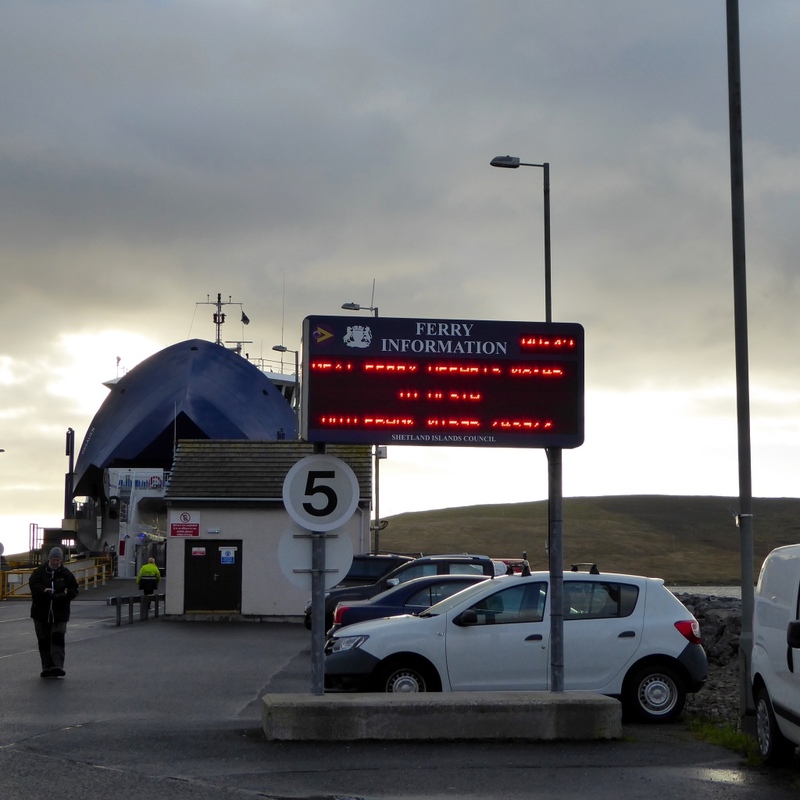 You could drive much faster from Mainland to Unst, was it not for the ferries. A tourist probably enjoys them, but I wonder what the people living in the islands think? Would they love bridges and much more tourists? I suppose this is a matter that divides people depending on what you work with. 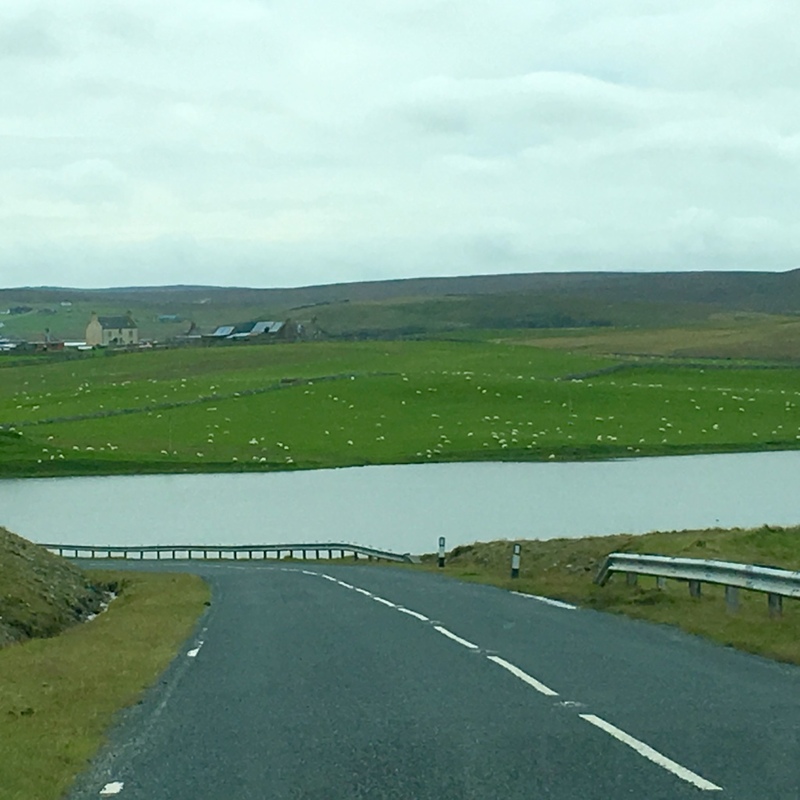 There was no fog, so we could see all the rather scary stone walls by the roads in Unst. I always find myself thinking of the people who build these walls, and had to maintain them year after year. All the work people have done! And still do, but in another fashion in the western world. In many places in the rest of the world you still use manual power for big projects. You may also have wondered why there are no sheep in my photos. 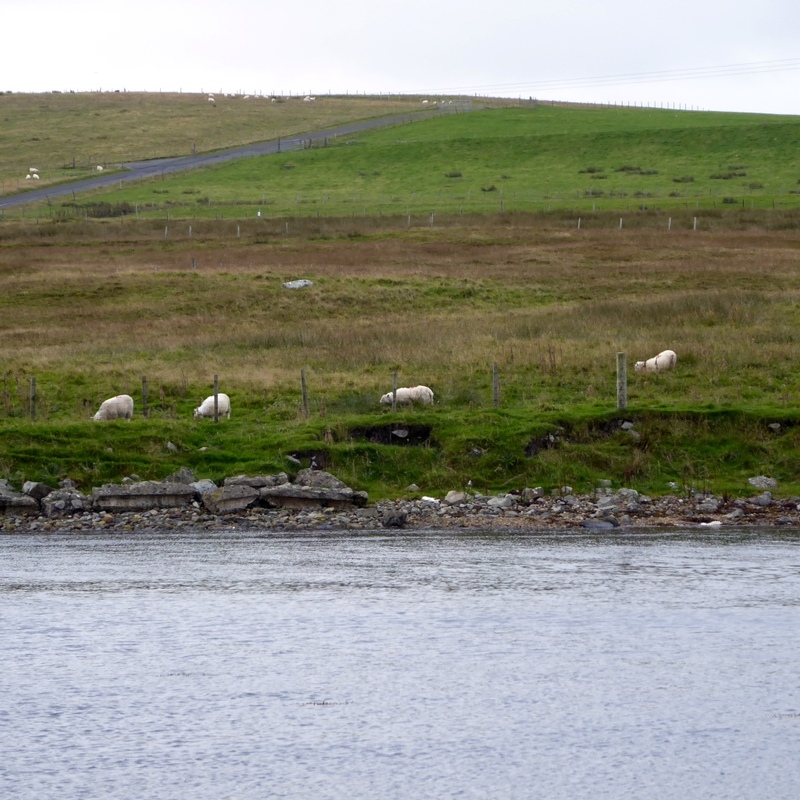 Because there ARE sheep in Shetland! Everywhere! But it’s not easy to take photos from a moving car, and if you stop and get out, the sheep run away. More stonewalls, more sheep, crappy photo from the car. This is what it looks like on many hillsides. 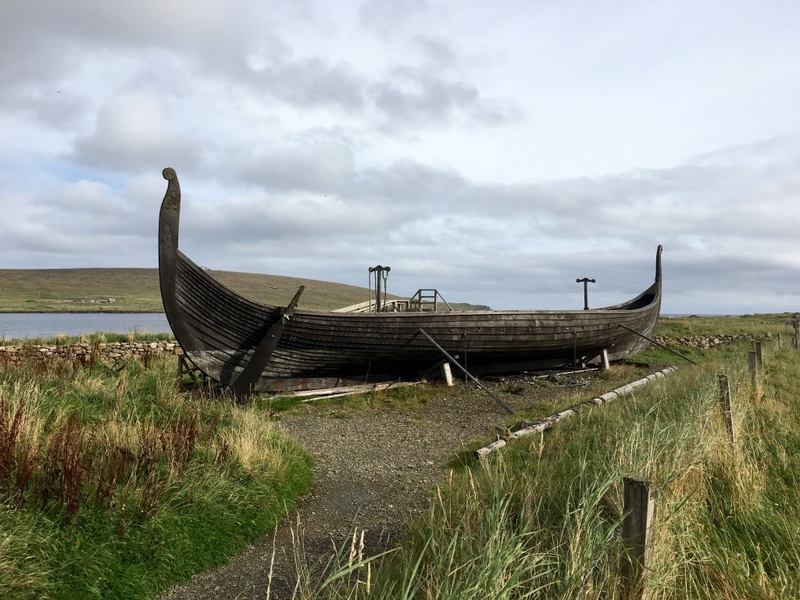 I have promised a post about Shetland Museum and Archives for a while now. I like museums, and I like this one very much. As with all museums, also this one has a lot more to show than you can see in the public exhibitions. For instance, textiles are often stored away from light that may damage them. 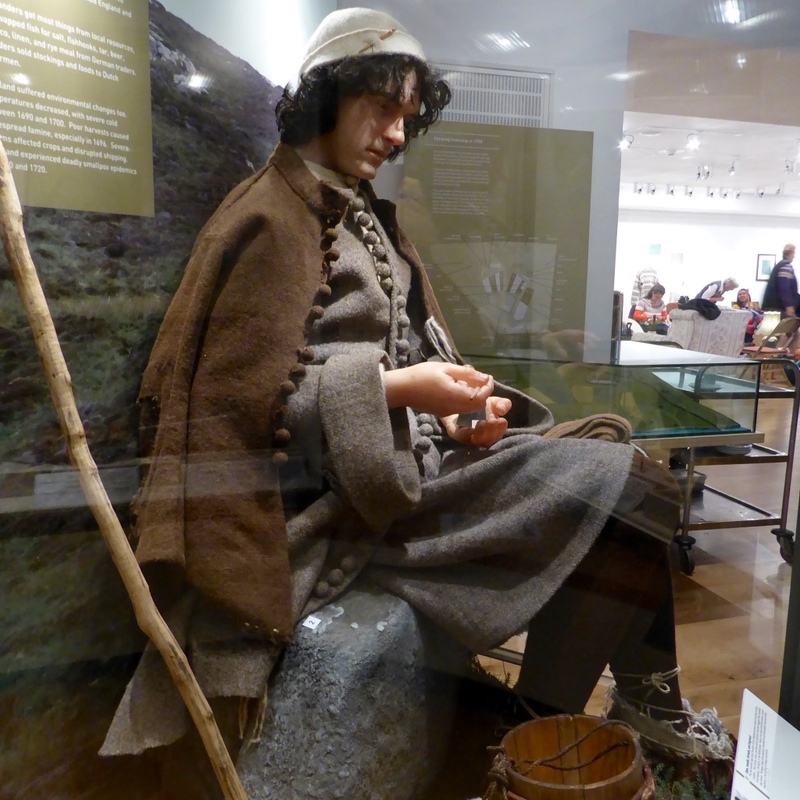 In the Shetland Museum you can still see a lot, both originals and copies. They are behind glass, which you can see in my photos, sorry for that. Sweaters, cardigans, vests, tops, hats, tams, scarves. 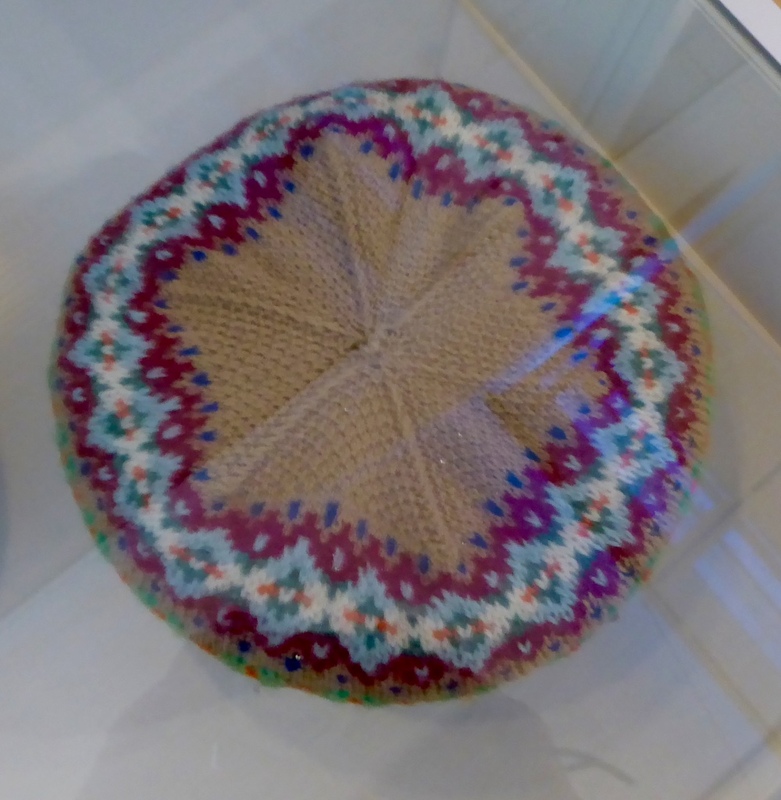 Stranded colourwork has developed especially in Fair Isle, the little island southeast of Shetland mainland. 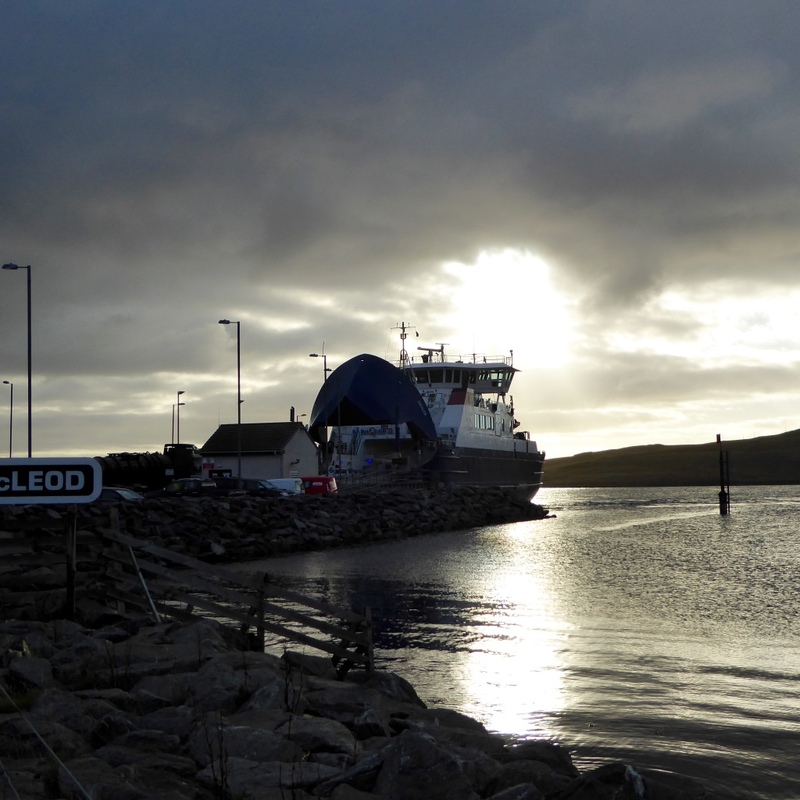 But it’s been, and is, practised all over Shetland. 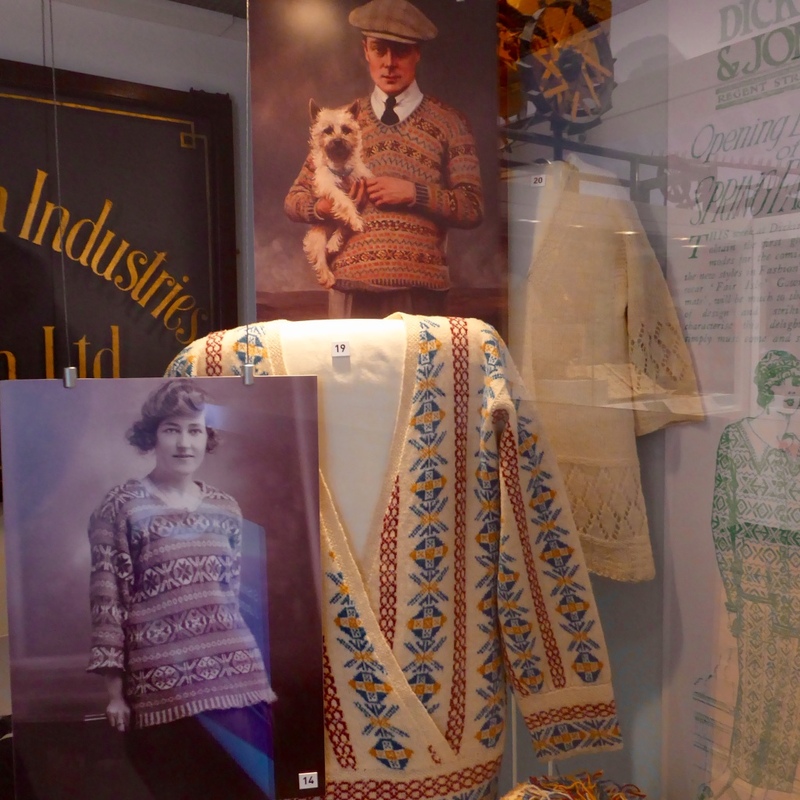 In one of the photos below you can see a photo of Edward, Prince of Wales, wearing the sweater that started a boom in the 192os. 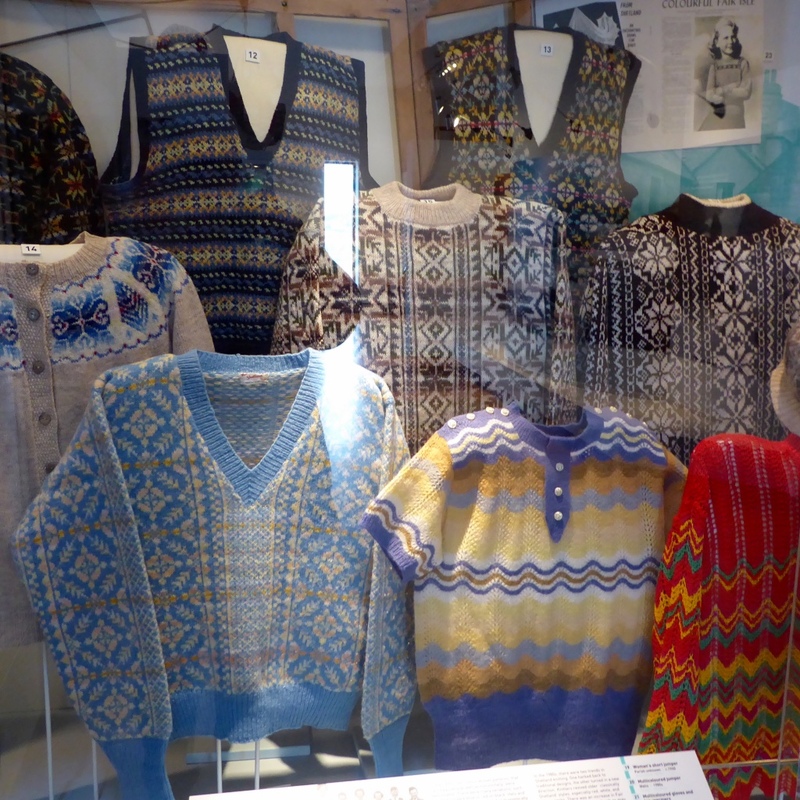 Fair Isle knitting is an ever changing story. Throughout its history the fashion of the period has influenced the patterns, and the colours used. Shetland tweed. 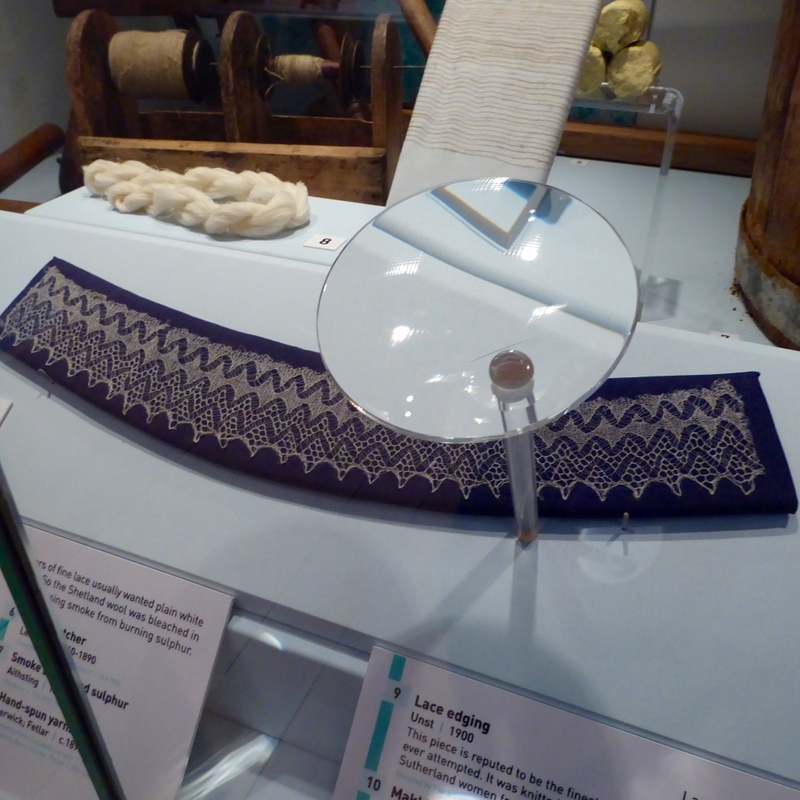 Weaving has been much more common in Shetland than is usually known. This would be something for me to explore next time. When you see all these beautiful textiles, you can’t but marvel at the women who did all this beside their everyday tasks. It’s overwhelming. I can’t fully comprehend it. 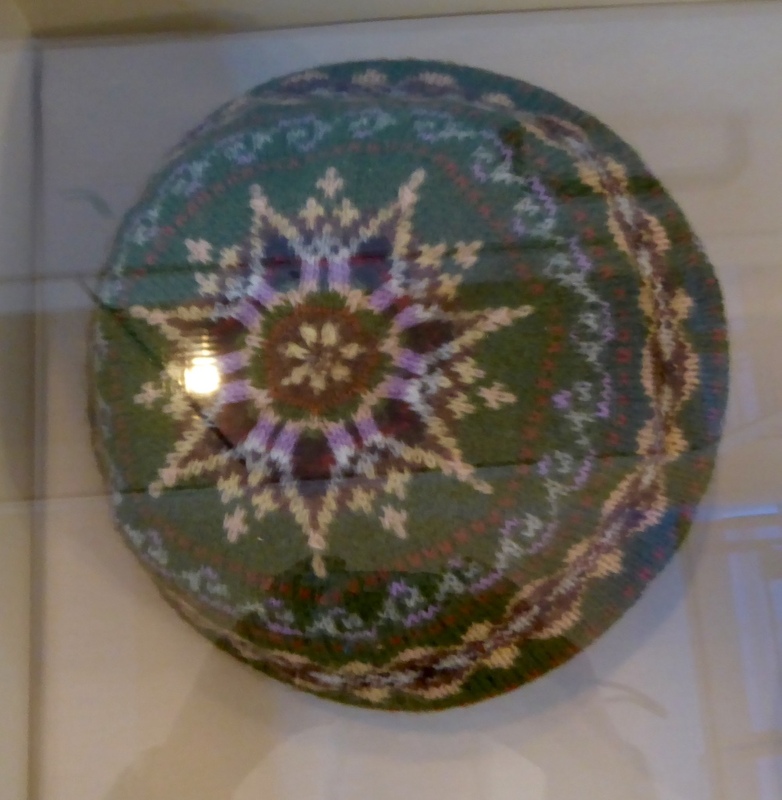 And when you come to the cases with lace – it’s then when a spinner and knitter would be happy for a chair to sit on, because the sight makes you feel weak. Lace shawls and haps, case after case. Sometimes the lace is so fine you need a magnifying glass to see it properly. 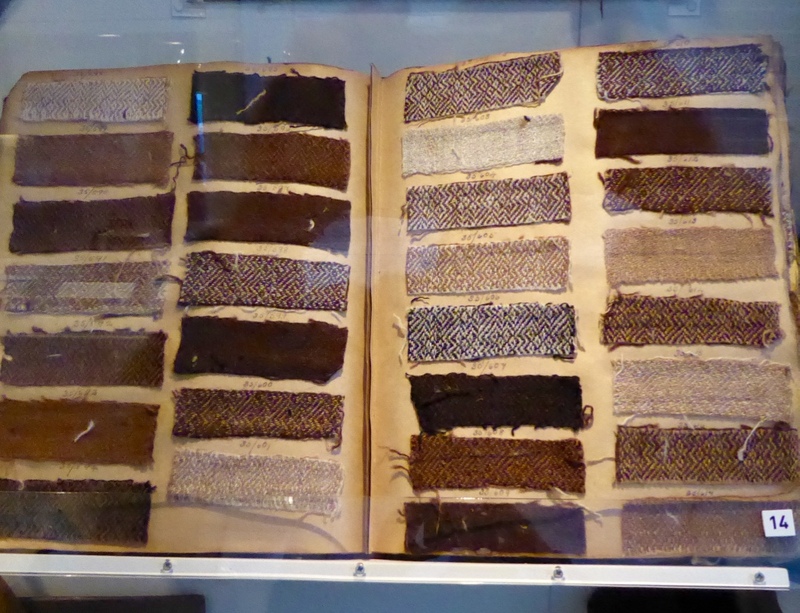 Samplers remind us that all knitters couldn’t read, and that there weren’t always charts to follow. 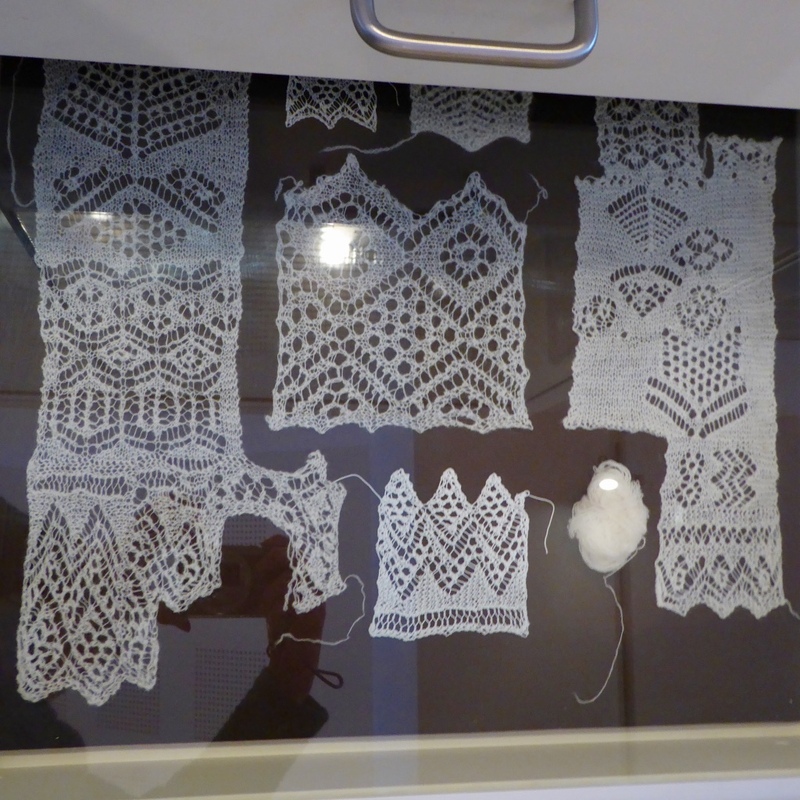 The lace knitters were extremely skilled. They made their own patterns, and they varied them in their own fashion. 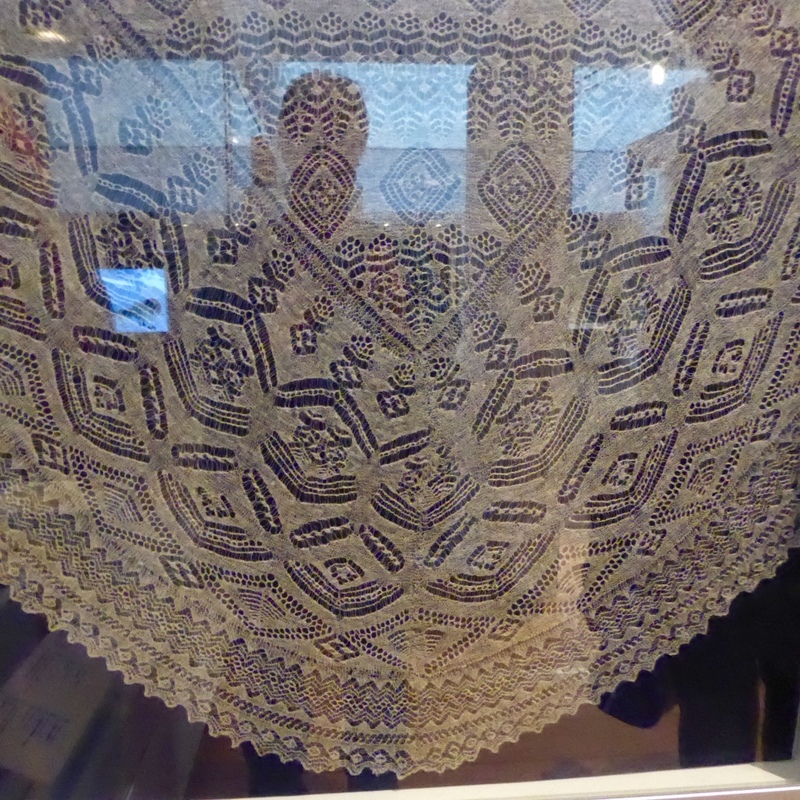 Skilled lace knitters work like that still today. The finest shawls are still called Wedding Ring Shawls. Even the biggest of these shawls can be drawn through a wedding ring. The equipment for spinning the fine yarns are the same we use today. Hand carders for the very fine Shetland wool, a spinning wheel, a niddy noddy, a lazy kate. In the photo below there’s also something we don’t use anymore: a smoke barrel with sulphur for whitening the yarns. 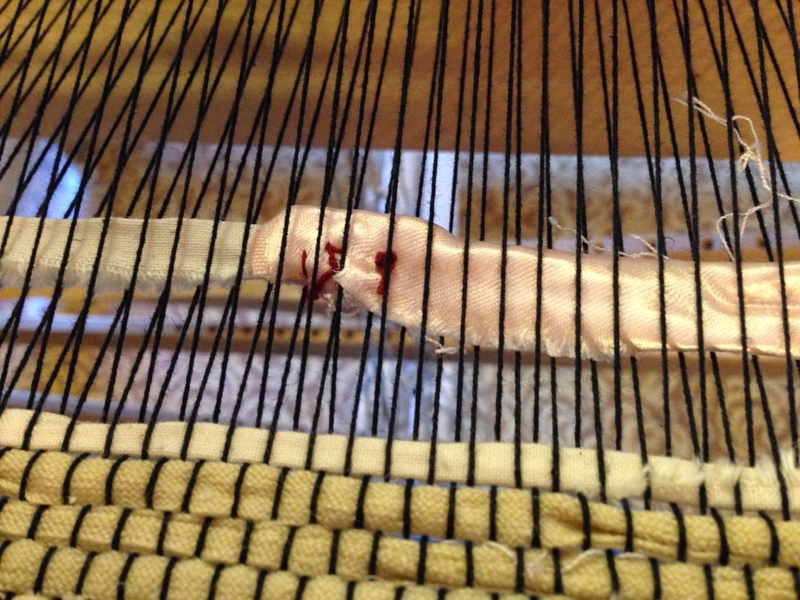 Nowadays some of us also use dog or cat combs to prepare the wool for worsted spinning. There’s lots more in this amazing museum! But I want to show you the Gunnister Man. The link takes you to Wikipedia, but there’s much more to read about him and his clothes and accessories. 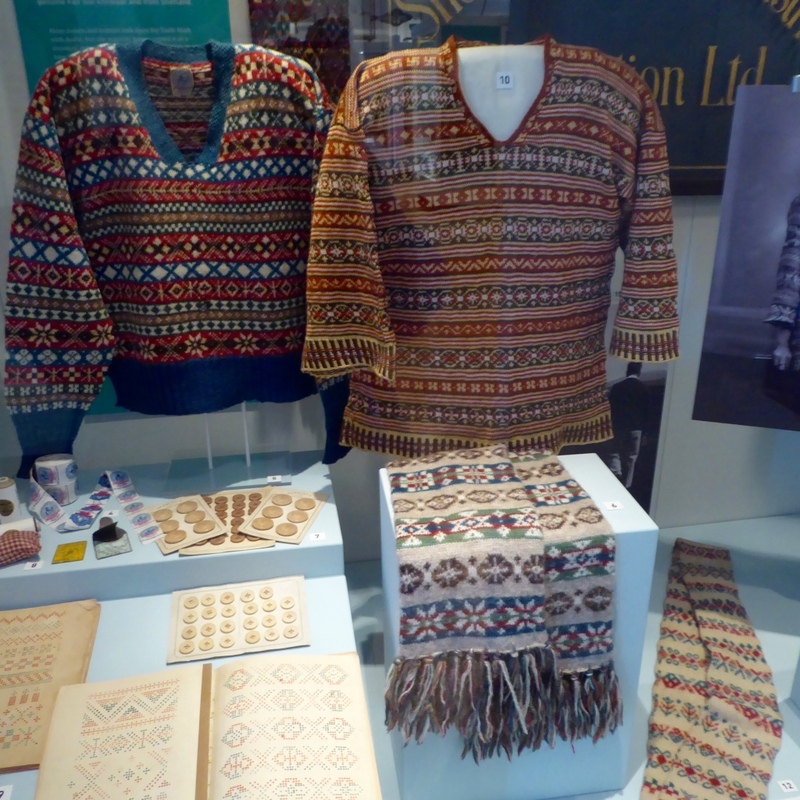 I like this article with lots of links: Costume Historian. There are a free purse patterns on Ravelry, the link takes you to one of them. I’ve made a few purses to give away to friends. 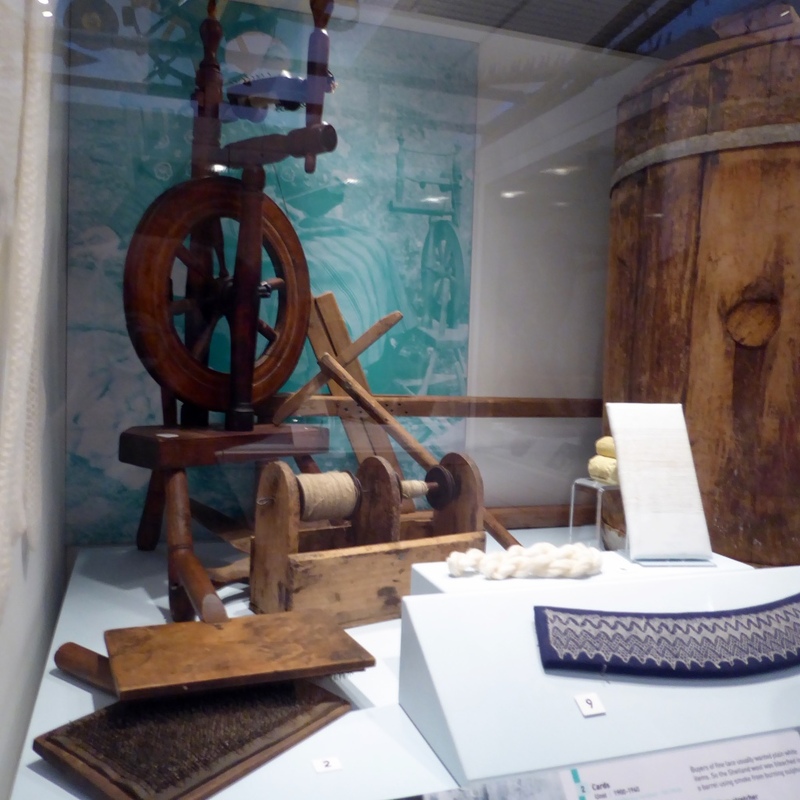 This year’s Shetland Wool Week hub was in the museum. 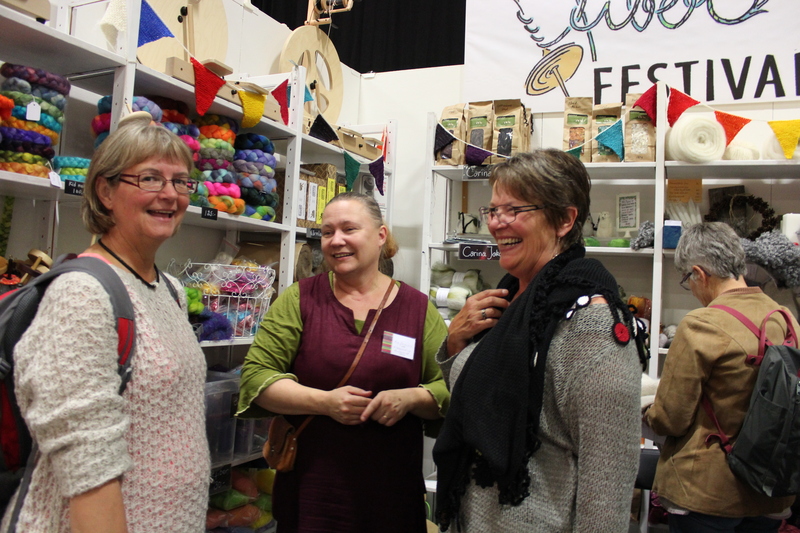 In the hub you could meet other attendants, sit down and knit for a while, have coffee or tea, get information about everything concerning Wool Week. You can see some of the knitters behind the Gunnister Man. 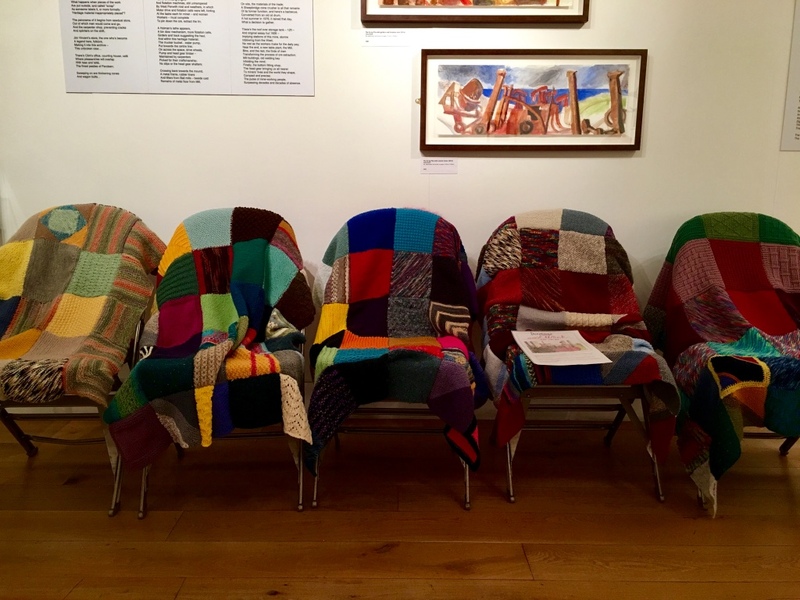 You could also take part in a charity project by knitting a square or two for a blanket, bring them to the hub, and have them sewn on to a blanket. 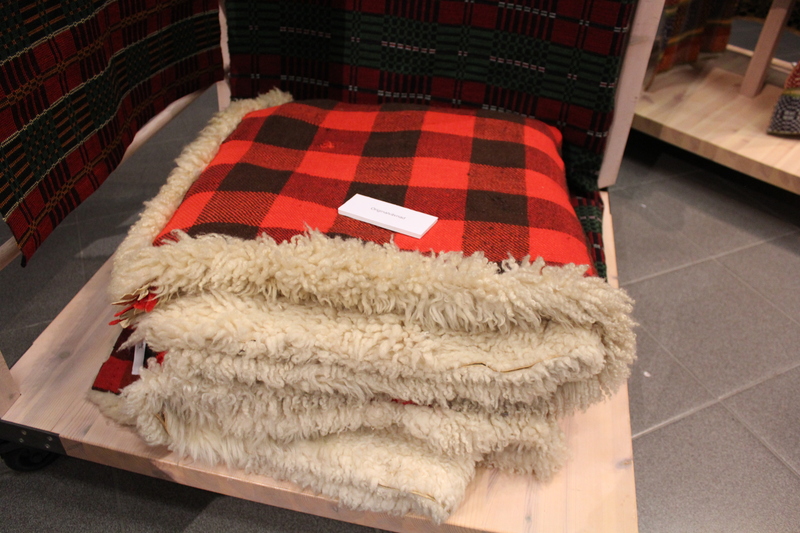 The blankets will be sent to South Africa to children that have lost their mothers because of aids. I knitted three squares. 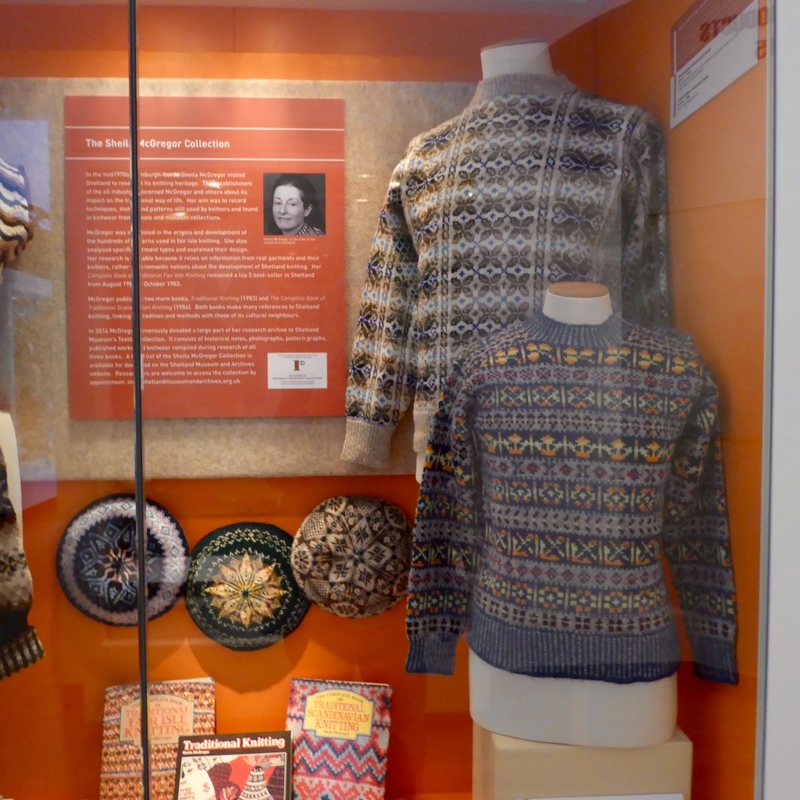 If you want to know more about knitting in Shetland there are lots of books and articles, and much to be found on internet, like the museum’s digital photo archives. I will show some of the books I own in my next post. 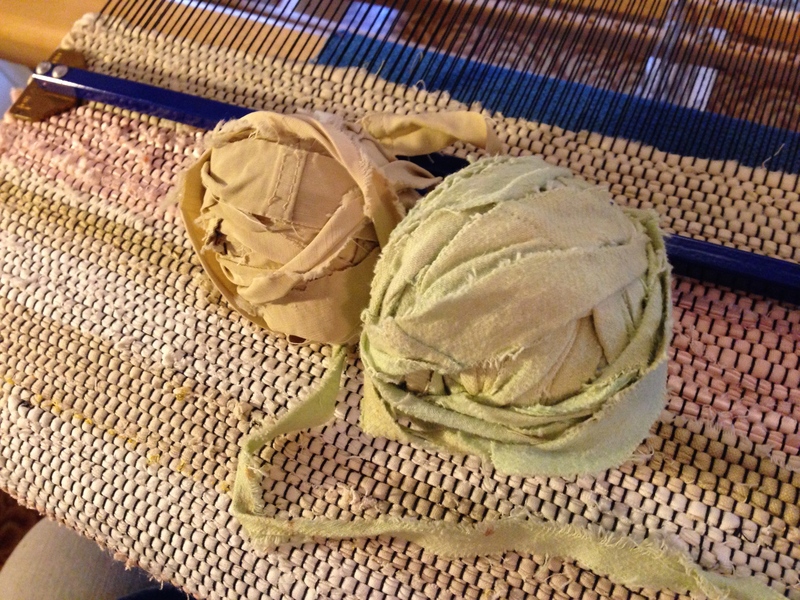 When I looked deeper into my box with rags cut for weaving, I found a ball that seemed to have at least two colours in it. The weft was clearly cut by my grandma, so the ball has followed me for centuries. My mother gave it to me in the 80s when I bought my first loom. I also found some blue rag weft that a friend gave me in the 80s, and green-white stretchy rags that came with my new loom. 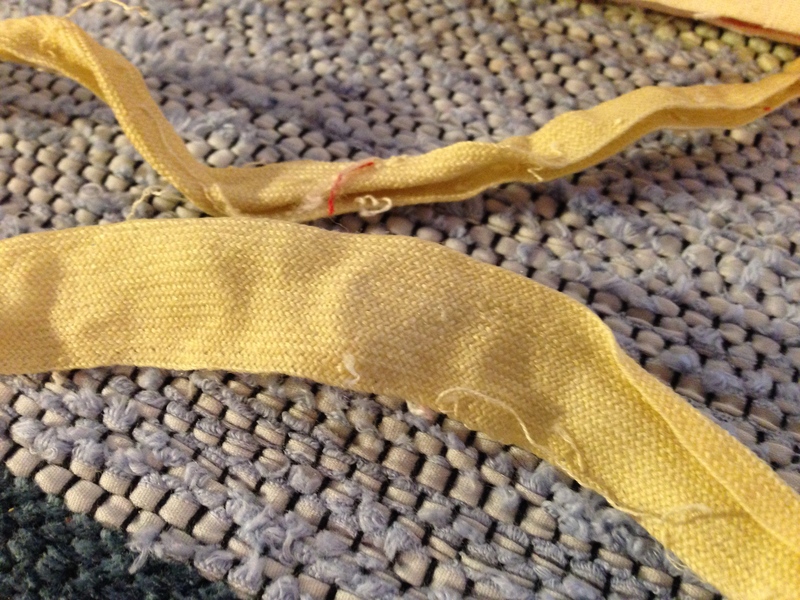 There’s off white cotton of several kinds, some tightly woven, some that seems to be of the kind used for bandage, muslin, a cotton band that must have been used for lining, and pink, shiny fabric that must have been underwear of some sort. Don’t mind the green weft above. 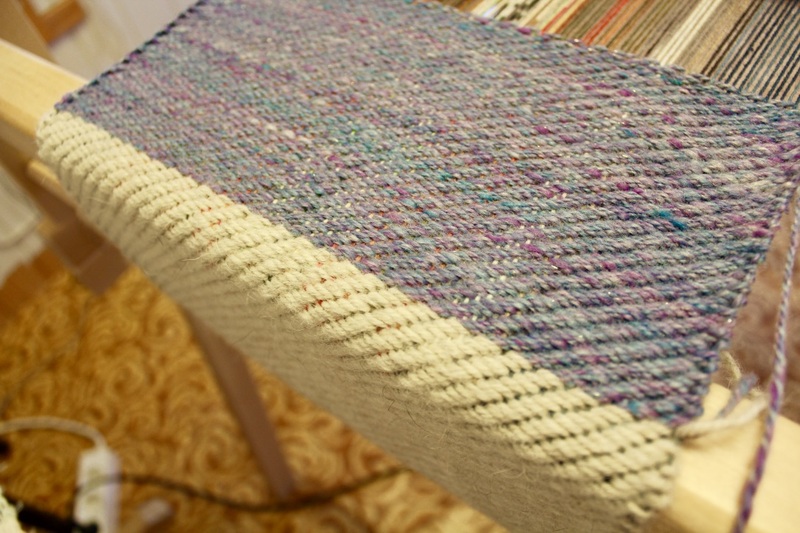 It’s there only to separate the place mat I wove earlier from the blue-white-green-pink rug I’m weaving now, and will be removed later. 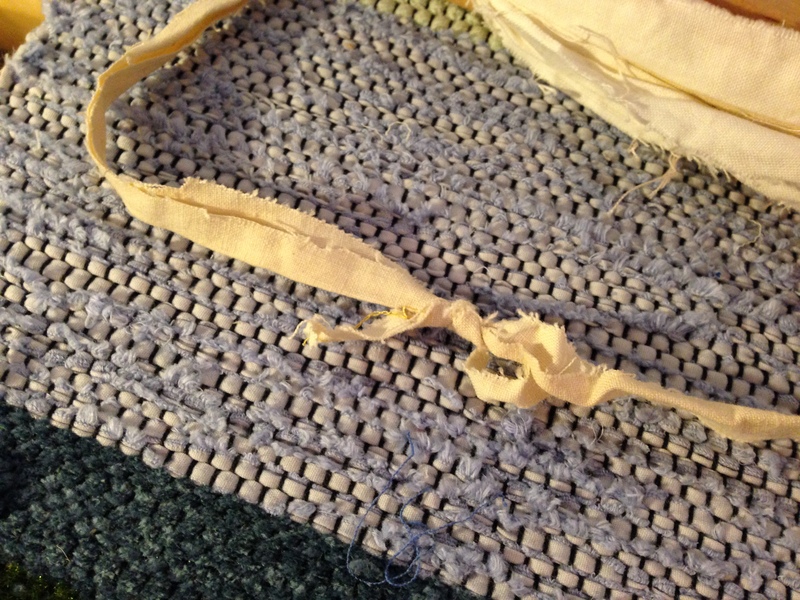 I tried to open one of the knots, but grandma was strong still in her old age. She was close to 90 years old when she sat in our garden turning old clothes into something useful. I couldn’t open the knot, so I decided to leave everything in the ball as it was and just beat it into the weave. I don’t mind the bobbles! 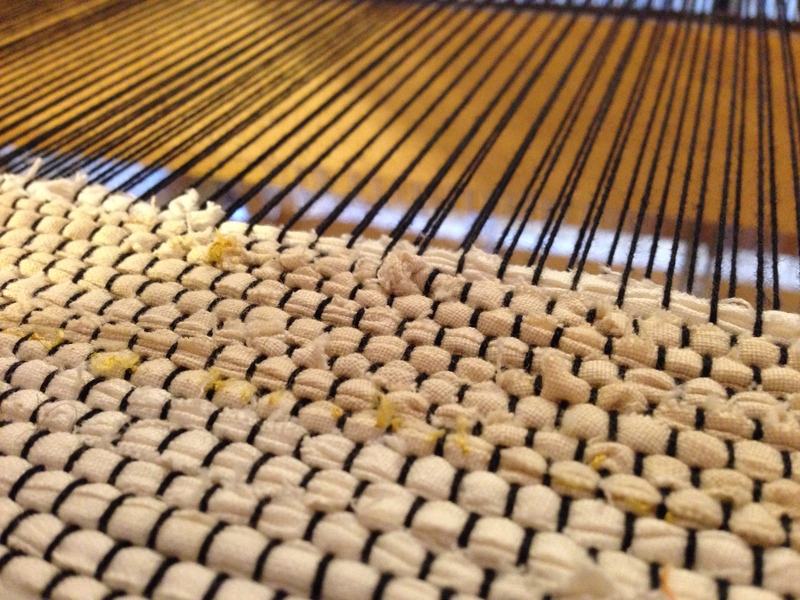 This will not be a very strong rug weave as I don’t beat very hard. This is one way of cutting fabric. When you reach the end of the piece, cut like this. 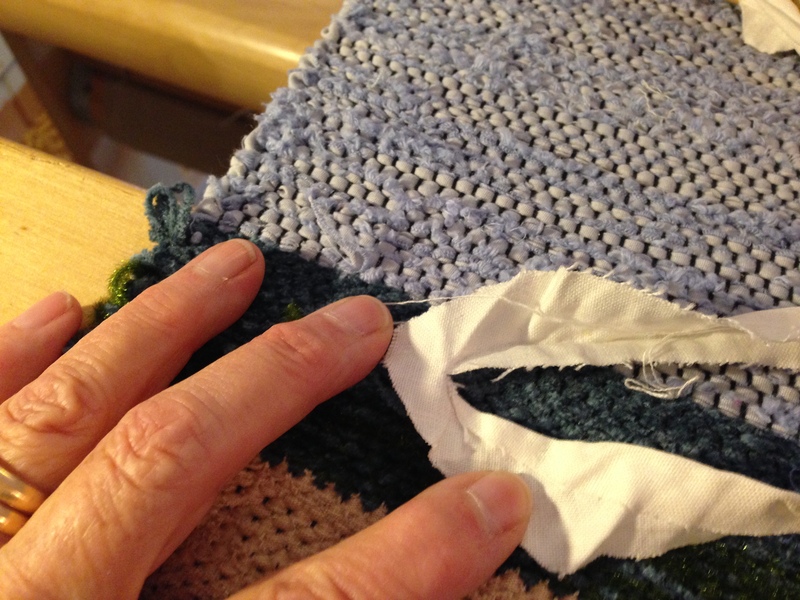 You can also cut to the end and sew the pieces together. Nowadays I think people just trim the ends and place them along side each other and beat them in. I do that most of the time when I weave poppana. Oh grandma! I loved her. She worked hard from early childhood, only the last years where easier. She used to sit by the window watching people go by, and once in a while she made coffee and we had a cup together. I’m so happy she lived in our house the last few years of her life. So now I’m started. 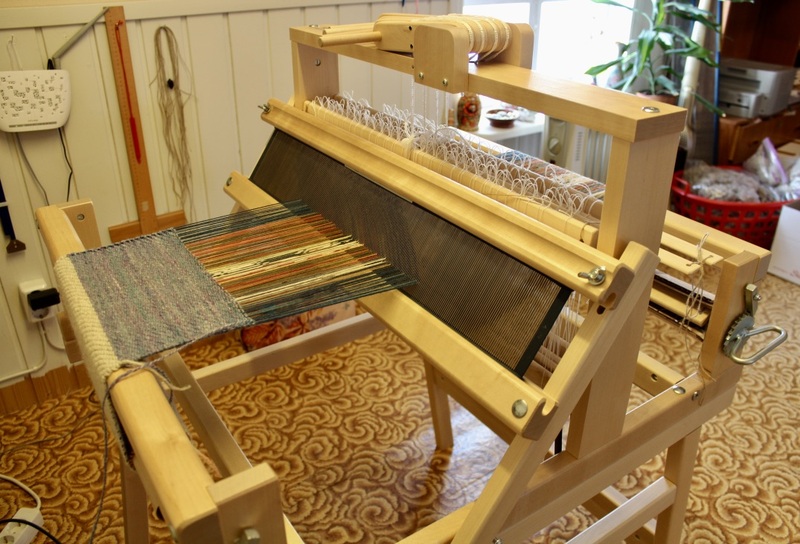 As I haven’t woven with a loom for almost 30 years, I started with plain weave and poppana rags, the industrially produced thin rag weft that was so popular in the 80s here in Finland. You can still buy it in weaving shops. I found my old poppana in the attic, and also some of my grandmother’s rags, probably from the 60s. She used to sit in the sun in the summers and cut old clothes into rug weft. She would hurt her fingers from all that cutting, so she wound some of the rags around her thumb and middle fingers to protect them. Hubby went to work the day I was to wind on, so I decided to do it on my own. It’s good to have thick, heavy books in your shelves! I put weights on the warp, wound on, opened more of the warp chain and adjusted the with, fetched a bucket and filled it with heavy books and attached it to the warp, wound on 10 meters of cotton… it’s not the best wind on you’ve seen, but I think it’ll work even if I’ll probably have to adjust some warp threads when finishing the fabric. 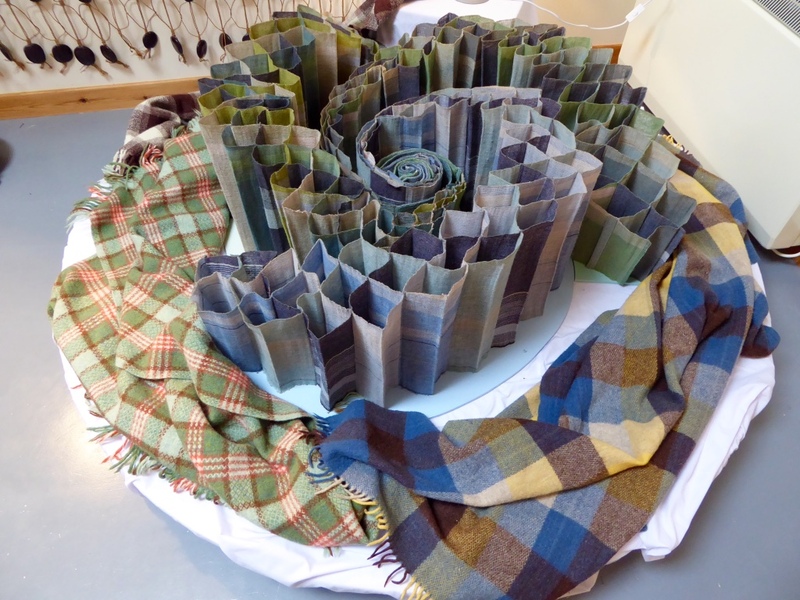 That’ll be easy, as I weave short pieces like place mats. 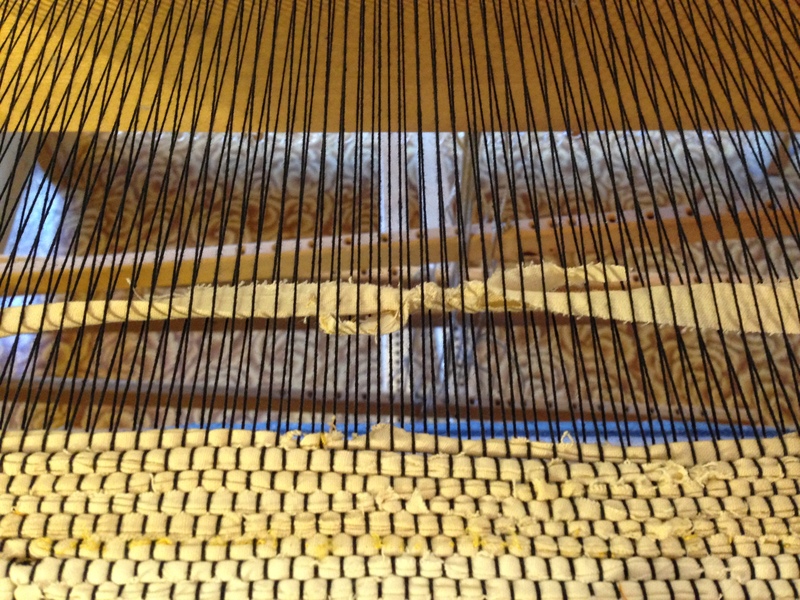 The most difficult thing was to crawl into the loom to tie up the horizontal lamms and the treadles. And then I had to crawl out again! I’m not in the same shape I was 30 years ago. But after the third time I felt I was ten years younger – what a work out this is! 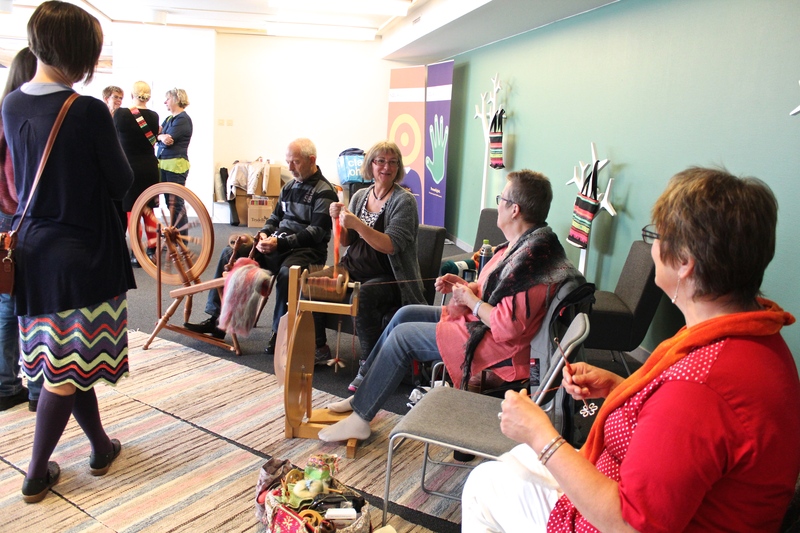 When I asked people at the Väv 14 event in Umeå what kind of loom I should get for the needs I have nowadays, quite many said “not a counter march loom”. 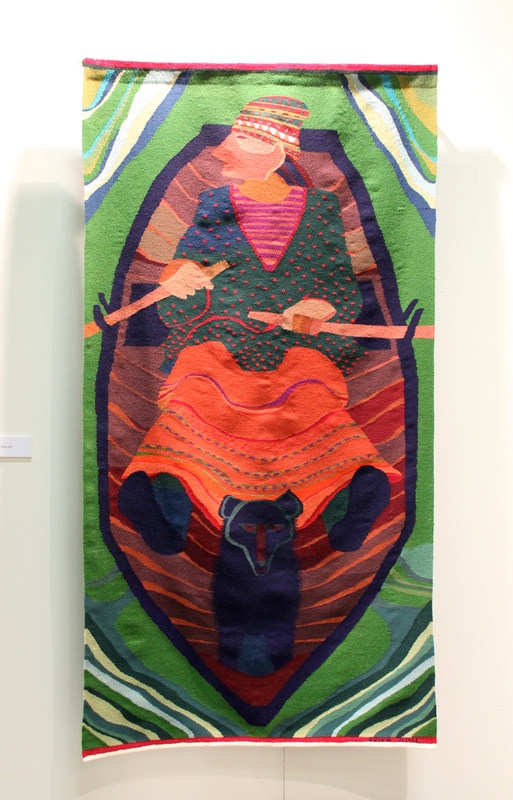 I was quite surprised, because 30 years ago that was exactly what you should get if you were a serious weaver. The explanation was even more surprising: it’s difficult to tie the treadles! But I’m not afraid of tying the treadles, and after having tied the lamms for the first time I won’t have to do it again, as they are always the same, only the treadles vary. I have good books with clear instructions. I’ve done it before. I think it’s good for me to do difficult things, and besides, it’s difficult only the first time you do it. 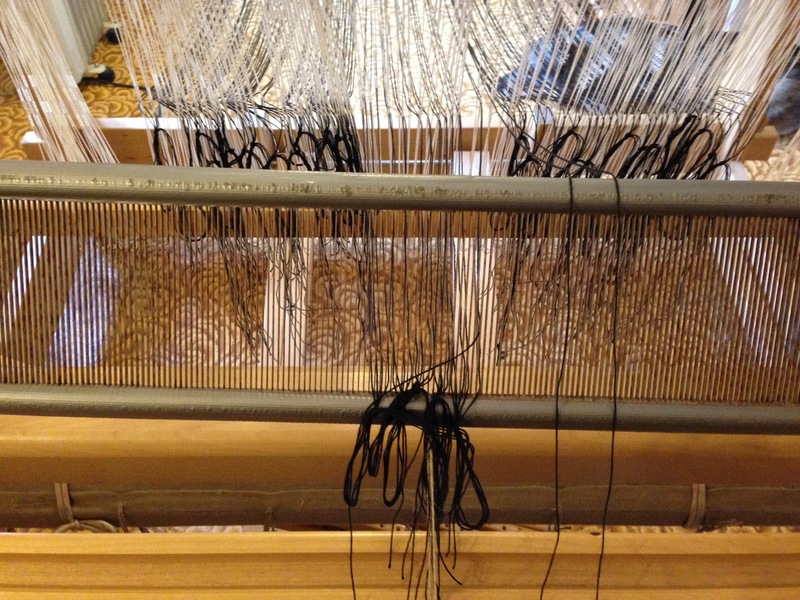 So contrary to the advise from these well meaning persons I now have a horizontal counter march loom, and I love it. It feels wonderful to grip the beater and have a go at it. The sheds rise perfectly, which is one of the advantages of the counter march. I have more fun to learn: weaving terms in English and Swedish. I learned to weave in Swedish, but the weaving book we used was in Finnish, so I learned most of the terms in that language. The Finnish book is the best I’ve seen, and luckily I still own it. Many of my Finnish readers will know it: “Kankaita kutomaan”, written by Arja Hauhia and Marja-Liisa Paavola. And otherwise? It’s soon November. 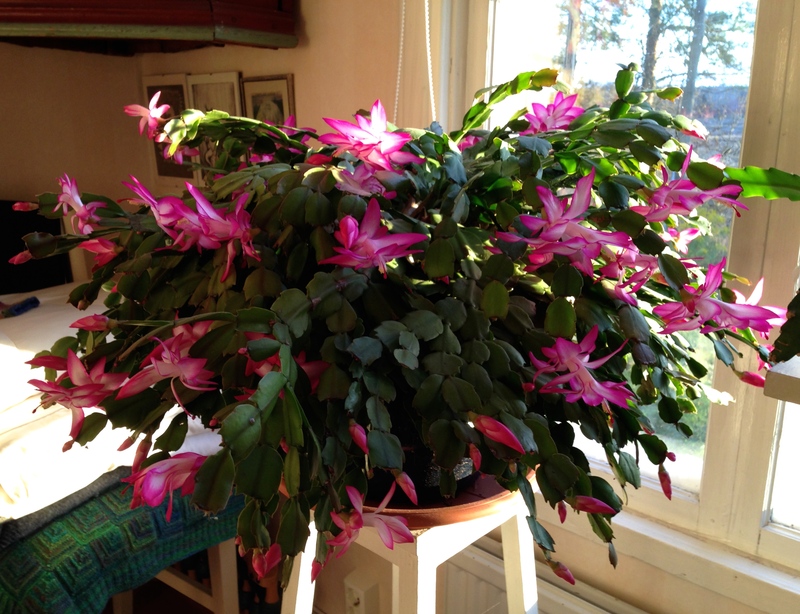 This cactus, Schlumberga truncata, is called “November kaktus” in Swedish, because it often blooms in November. It was out under the rowans in the summer, and now it thanks us with lots and lots of pink flowers. 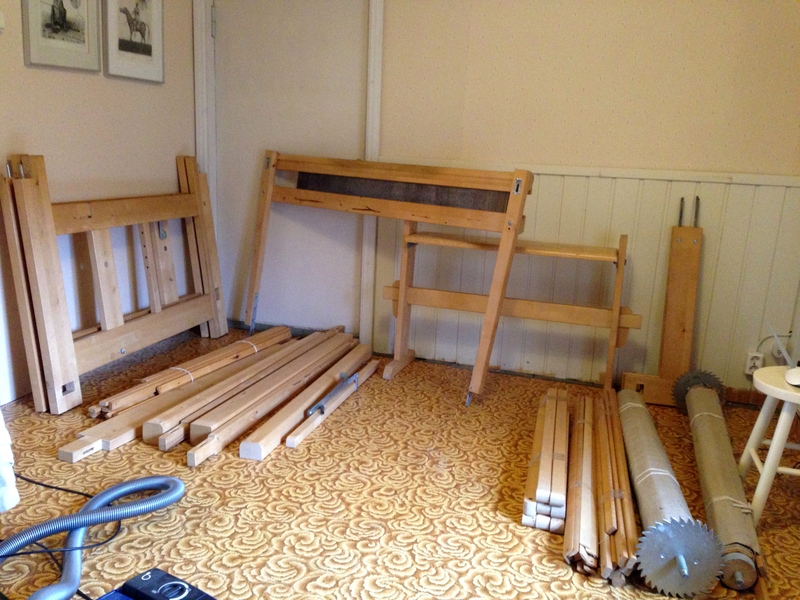 I don’t have much to say because I’m stunned – I keep admiring my new (second hand) loom. I have been longing for a loom for a long time, and all of a sudden I have one. It’s a counter march, 120 cm, 8 shaft loom. Perfect! Kasper isn’t interested at all. I had a similar, but bigger one, in the 80s. It’s made in a prison, a kind of therapy work I think is excellent. I’ll return when I have something more to say! I have been to my first Vävmässa! I have wanted to go for a long time, but thought I really don’t need to as I’m a spinner, not a weaver. 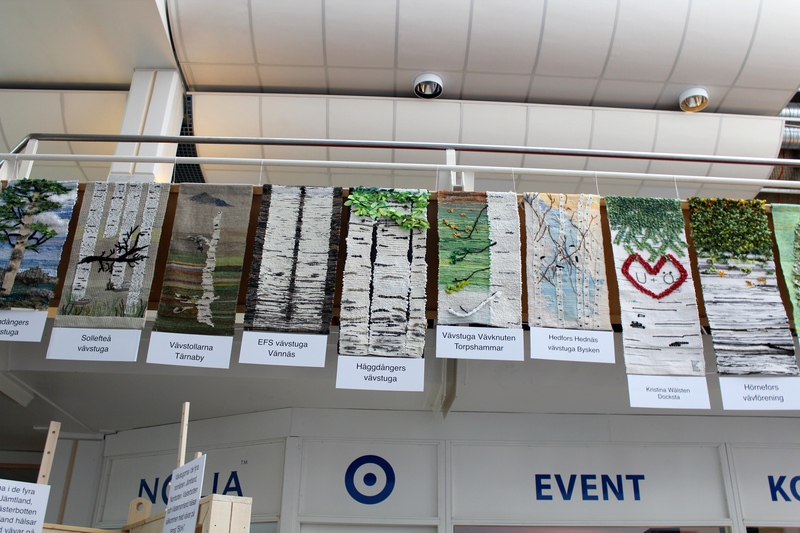 This year the fair was in Umeå just across the Gulf of Bothnia, so I decided to go. And I’m happy I did. 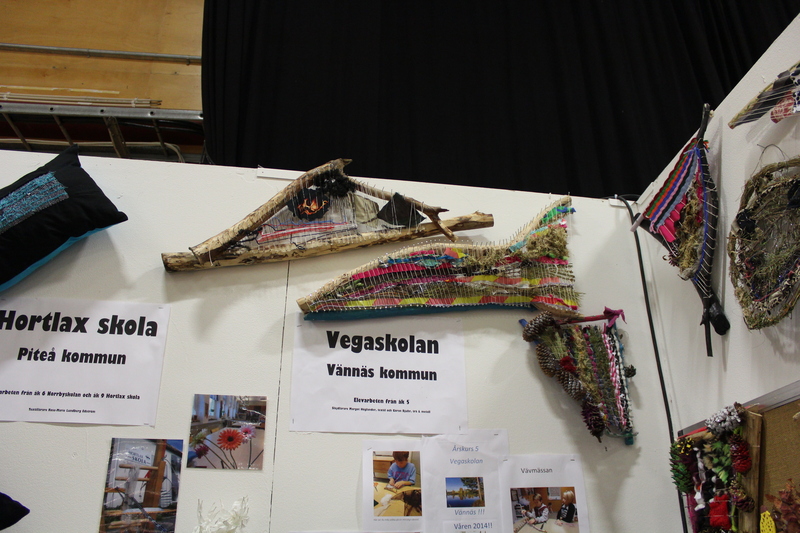 It’s three years until the next Vävmässa, so there’s time to plan for the next weaving feast! First of all I met three spinners from Sweden: Britt-Marie, Kia, and Elaine. The next day Britt-Marie, Elaine and I spun at the World Wide Spin in Public event that took place by the entrance of the fair ground. 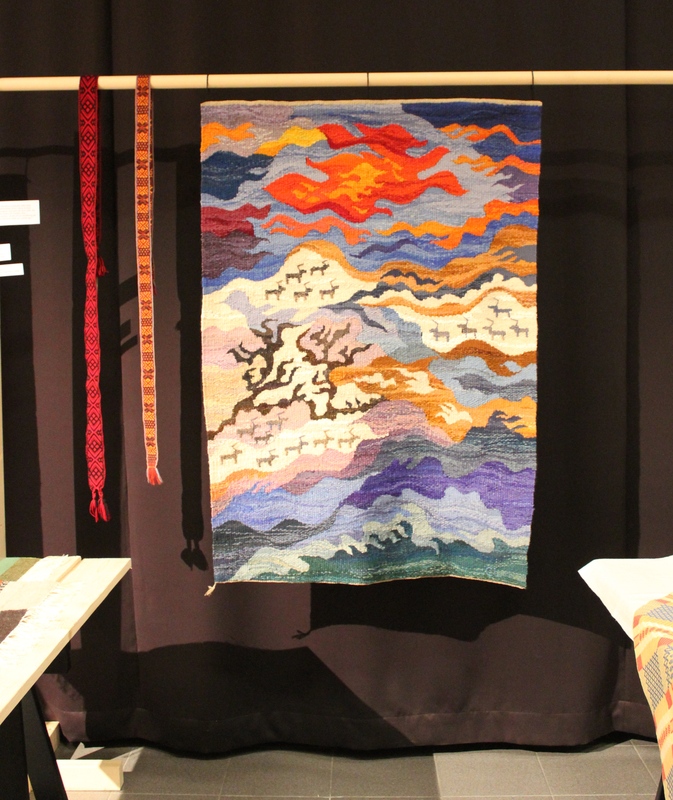 If you are in the Umeå area next week, this is the place to go: Fiberfestivalen. It’s next to Umeå with easy access on train or bus. 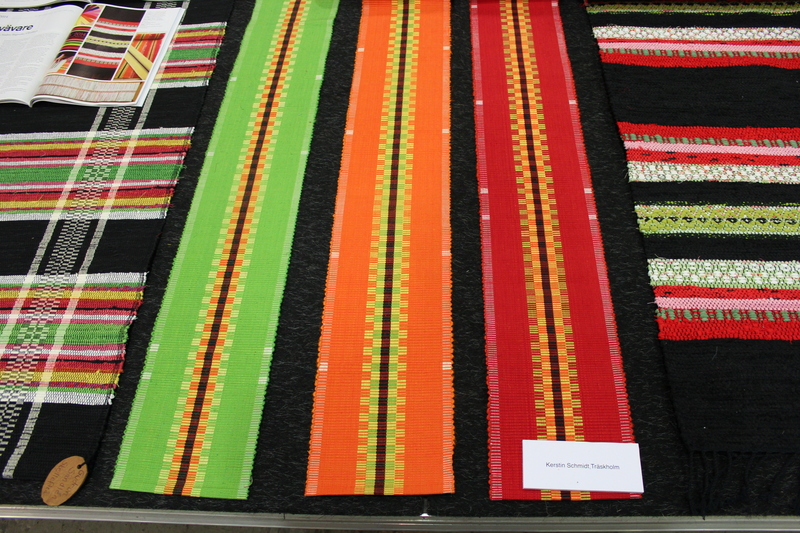 I saw so many beautiful weaving, high class yarns, and looms. 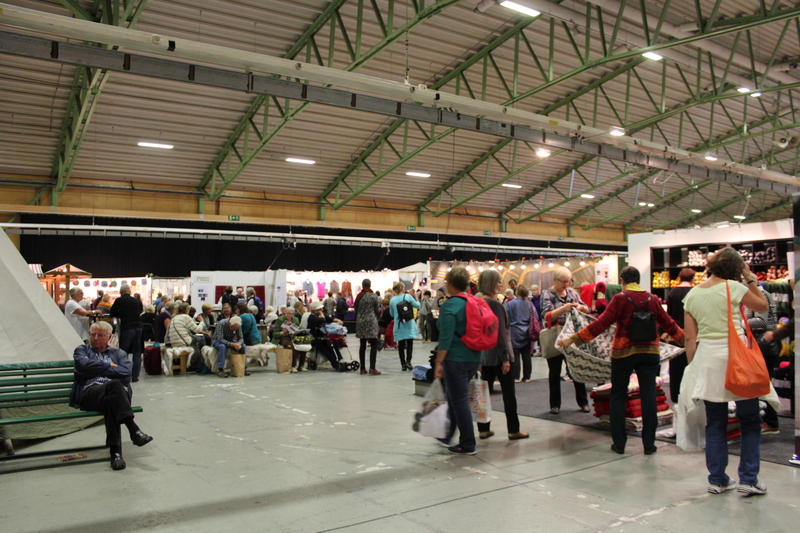 There were exhibitions of old an new weaving mainly from northern Sweden, a workshop area, and of course vendors. This was the first thing I saw when I entered the vendor area, and I thought Oh my god, how will I see anything among all those tall Swedes? I’m quite short, you know. But I soon found that the grounds were big enough with lots of space, so it didn’t feel too crowded once you were there. 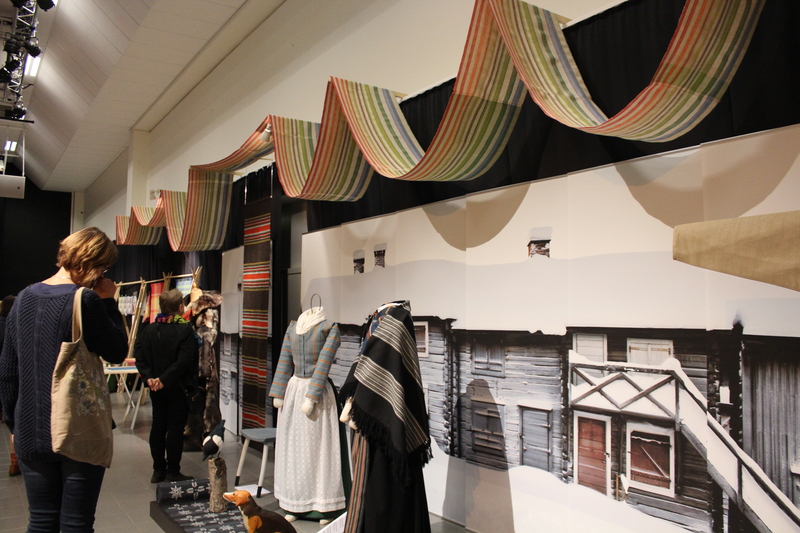 There was so much to see and marvel at for a non-weaver. 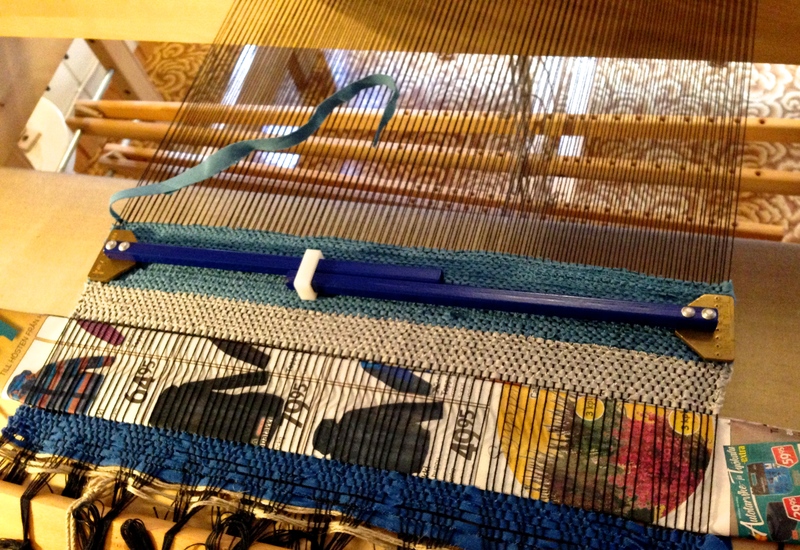 I bought thin organic cotton yarn for my band weaving, and the awesome shuttle for band weaving from Stoorstålka, and a book. 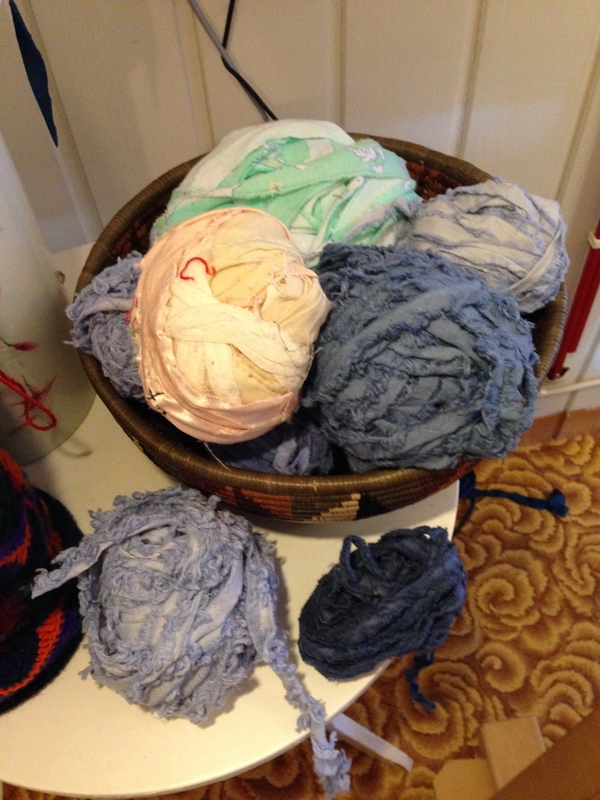 On Saturday I spindled the whole day except for lunch and purchasing the yarns. It was a fun WWSIP, and I met several spinners from Sweden I didn’t know from earlier. 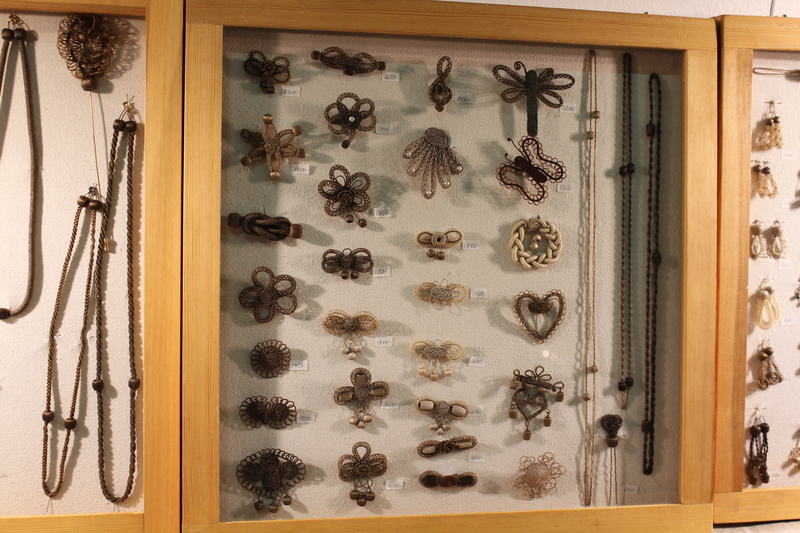 Some only dropped in to say hello, like several members of the Online Guild of Weavers, Spinners and Dyers. Take a look at the lady’s skirt: soon I’ll show more of that design! 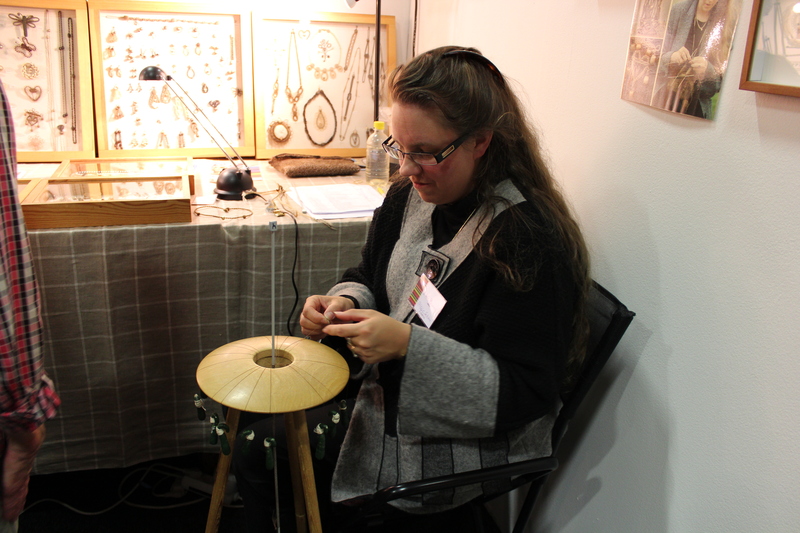 I also saw a very rare person: a “hårkulla”, Nina Sparr who makes accessory from human hair. 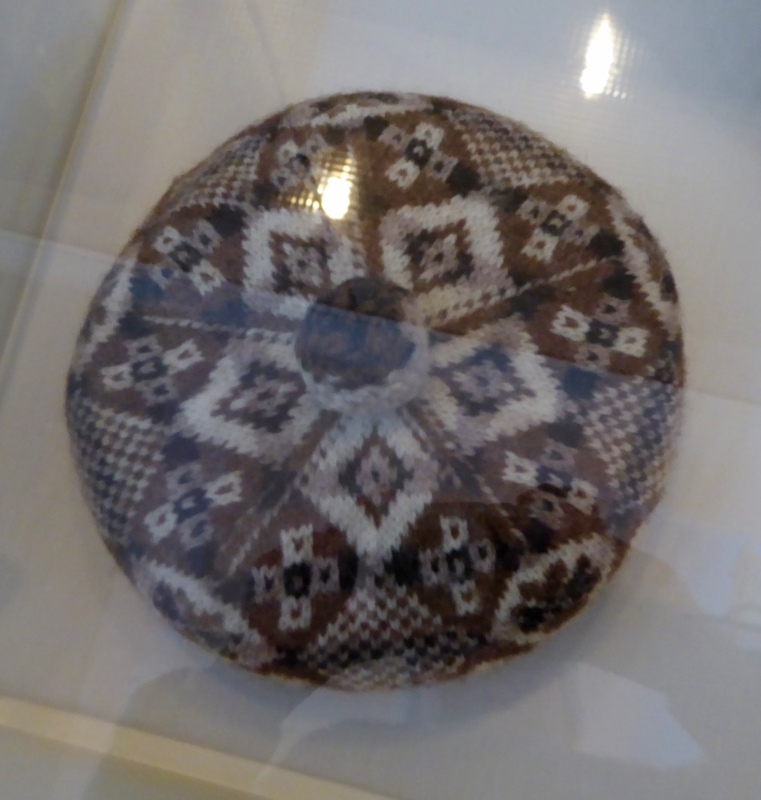 This craft used to be an income for women in earlier days. Now there aren’t many left, so I was lucky to see one.